Groundhog got so fat, he couldn't come out of his burrow. Maybe we can't chalk it up to self control. If we make food so plentiful that people *can* overeat, it seems like they will. Costco and restaurants are making us fat. Could it really be that simple? "When you have a widespread obesity epidemic it goes beyond personal choice and simple diet and exercise. There is a problem with processed American food. It's bad for us." ........................... I've been saying this forever, yes, personal responsibility is a good thing, but when the entire population is getting so fat, it's not something you can cast off as "Oh, one day people will wake up." .... That's why I supported Bloomberg's ban on large sodas. Unfortunately, you HAVE TO think for people, sometimes. 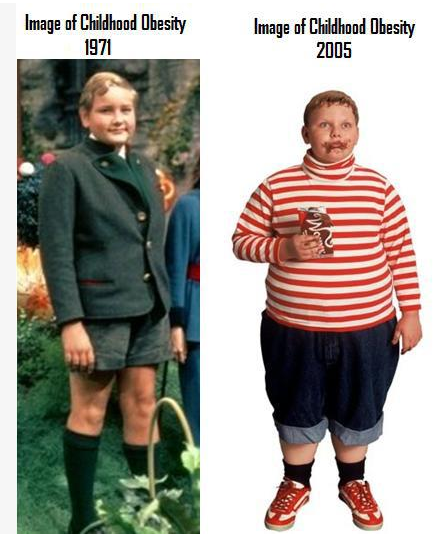 Comparison of a depiction of childhood obesity in the 1970's Willy Wonka film vs the depiction of childhood obesity in the 2000's Willy Wonka film.